Ruth Whitman was an American poet, translator, and professor. She was a founding member of Alice James Books. Her honors and awards include a Senior Fulbright Writer-in-Residence Fellowship to Hebrew University in Jerusalem, a Bunting Institute Fellowship, and a National Endowment for the Arts Literature Fellowship. 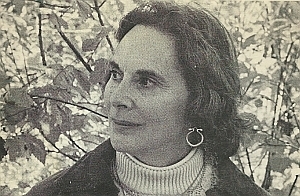 Her poems were published in literary journals and magazines including AGNI and Ploughshares.